Finger Lakes Winery introduces new packages focusing on group parties and intimate events. 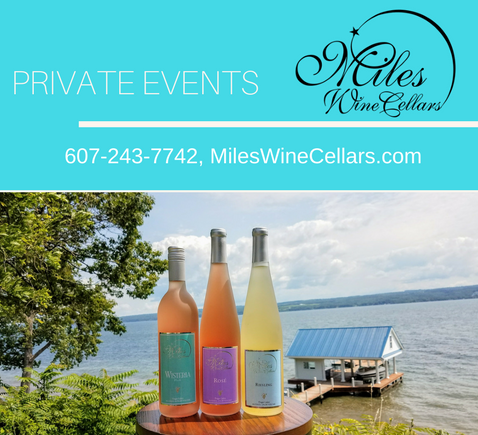 Miles Wine Cellars is proud to announce their new packages for private events at their Finger Lakes winery. Events include small gatherings, such as cocktail parties, business meetings, to special occasions, such as birthdays, anniversaries, engagement parties, rehearsal dinners, brunches, and showers. The smaller events give more attention to detail, and Miles Wine Cellars is dedicated to superior service. The property on Seneca Lake has many attractive benefits for private functions that is a step above others. The majestic estate is filled with rich history, incredible scenery, and award-winning wine and craft beers. Miles Wine Cellars has also created an extensive menu filled with food, appetizers, and gourmet meals for the events. The venue can also include lodging at their inn, which features two newly furnished rooms. Some packages include The Riesling Package, great for small cocktail parties on their patio, The Cache Package for brunch, or the Cabernet Package, for grand weddings. The Chardonnay Package was created for small conferences and meetings in the Willow Room. Other private parties include rehearsal dinners, birthdays/anniversaries, and bridal/baby showers. People can customize packages to include wine, beer, and other New York beverages. Plus we they can create a tasty menu of food, coffee and desserts. More information for on-site events can be viewed online.